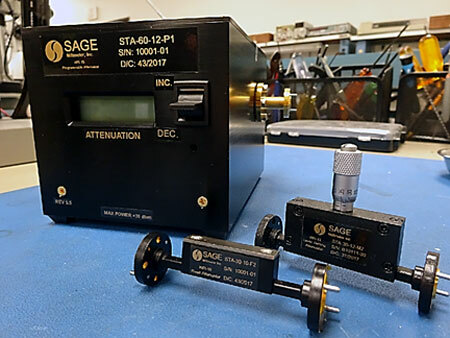 SAGE Millimeter offers four types waveguide attenuators: fixed, level setting, direct reading, and programmable attenuators. These attenuators are constructed with an E Plane resistive insert in the rectangular waveguide. The operating waveguide mode is TE10. The insertion loss and attenuation of this type of attenuator is frequency dependent. The difference between these two is that level setting attenuators have a micrometer for attenuation value reset or memorization, and fixed attenuators have their attenuation value set at certain value at center frequency. Although the attenuation value of level setting attenuators can be calibrated against the micrometer scales, it is not recommended to use the calibrated level setting attenuator as attenuation the standard; the attenuation level is frequency dependent. See the typical chart below for an E Band level setting attenuator. While the fixed attenuator is offered for link or path attenuation setting at a fixed value, the level setting attenuator offers a low-cost means to have a quick attenuation value set. Direct reading and programmable attenuators are constructed with a precision resistive rotary vane in a circular waveguide. The operating mode of the attenuators is circular waveguide TE11 mode. 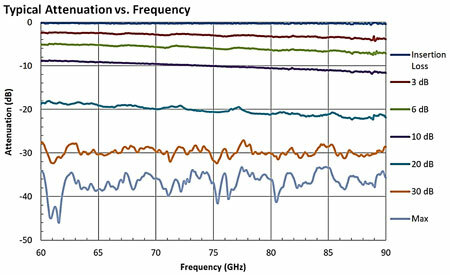 Unlike fixed and level setting attenuators, the attenuation value and phase shift of these attenuators are frequency independent. The reason being that the attenuation value of this kind of attenuator is strictly related to the area of the resistive vane exposed to the electrical field. Therefore, the frequency dependent element, length, remains constant while the rotating angle changes. 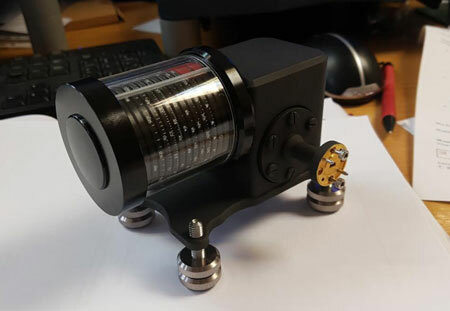 Because of this unique feature, the rotary vane based attenuator can be made for direct reading when the relationship of the attenuation value vs. rotation angle is characterized. The programmable version of this type of attenuator is made by replacing the drum with the digital control driver circuits. 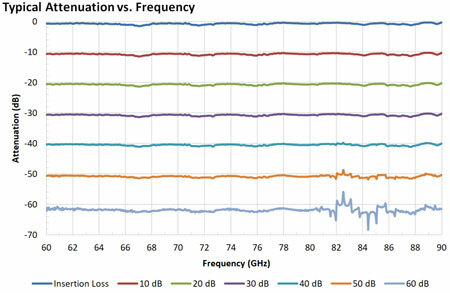 See the typical chart above for an E Band direct reading attenuator. Despite providing more precision and convenient attenuation settings, the direct reading and programmable attenuators are bulky and cost prohibitive.